US aircraft manufacturer Boeing has delivered two new Boeing 747-8F freighters to Russia’s AirBridgeCargo airline (a subsidiary of the outsize cargo operator Volga-Dnepr). This is the first delivery under a memorandum of understanding for 20 of the type, which was signed between Boeing and Volga-Dnepr at the Paris Air Show in June 2015. The agreement also added the Volga-Dnepr’s Antonov-124-100 aircraft to the logistics support for Boeing and its partners. One of the aircraft delivered to AirBridgeCargo became the 100th airframe rolled out of the Boeing 747-8 assembly line. The carrier will operate its new airliners to America and Asia as it is planning to expand its route network this fall and winter. Both aircraft are registered in Bermudas with tail numbers VQ-BFU (MSN 60117) an VQ-BFE (60118). 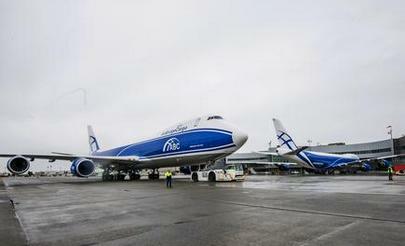 The newly delivered aircraft are bringing AirBridgeCargo’s total Boeing 747-8F fleet to eight units. The carrier began operating the type in 2012. It also has five Boeing 747-400ERFs and two Boeing 747-400Fs. AirBridgeCargo is Russia’s largest cargo carrier. According to the Federal Air Transport Agency, in January through September 2015 the airline transported 452,000 t of freight and mail, or 20.3% up year-on-year. For comparison, Aeroflot, the country’s second largest freight operator, carried 96,200 t of cargo in the holds of its passenger aircraft (down 5.3% year-on-year).